ApplicationWindow is a Window that adds convenience for positioning items, such as MenuBar, ToolBar, and StatusBar in a platform independent manner. The Qt Quick Controls - Gallery example is a good starting point to explore this type. contentItem.minimumWidth The minimum width of the content item. contentItem.minimumHeight The minimum height of the content item. contentItem.implicitWidth The implicit width of the content item. contentItem.implicitHeight The implicit height of the content item. contentItem.maximumWidth The maximum width of the content item. contentItem.maximumHeight The maximum height of the content item. This property holds the MenuBar. By default, this value is not set. This property holds the status bar Item. It can be set to any Item type, but is generally used with StatusBar. By default, this value is not set. 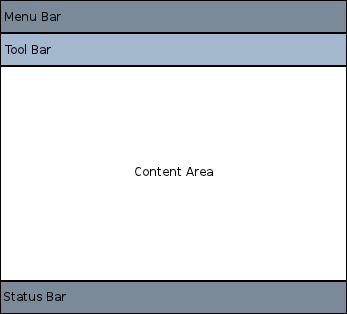 When you set the status bar item, it will be anchored automatically into the application window. The style Component for the window. This property holds the toolbar Item. It can be set to any Item type, but is generally used with ToolBar. By default, this value is not set. When you set the toolbar item, it will be anchored automatically into the application window.